Cucina Enoteca will be rolling out a second Orange County location, in Newport Beach’s famed shopping center Fashion Island. The restaurant, whose original OC space can be found at the Irvine Spectrum, is slated to open in the summer 2014. Like the Irvine venue, the new space will be featuring an array of rustic Italian cuisine and an extensive list of wines that may be purchased at retail prices. Dinner nightly. Cucina Enoteca, Fashion Island, 401 Newport Center Dr., Newport Beach, CA 92660, no phone. Bonefish Grill, the sustainable seafood restaurant chain based in St. Petersburg, Florida, opened a new location in the Tustin Marketplace. The restaurant marks the first foray into California for the national dining venue, whose culinary philosophy is anchored by a dedication to responsible fishing practices. As is the case with the other locations, this space features a host of daily hand-cut fish items along with steaks, pasta, chicken and pork dishes. Bonefish Grill, 2915 El Camino Real, Suite 3040, Tustin, CA 92782, 714-368-7613. Selanne Steak Tavern, the highly anticipated steakhouse owned by current Anaheim Duck and future NHL Hall-of-Famer Teemu Selanne, has opened in Laguna Beach. The venue, which occupies the two-story space that formerly housed French 75, offers a casual dining experience on its lower level, a more sophisticated steakhouse vibe on its upper floor, a full bar featuring a California-centric wine list and artisan cocktails, and an outdoor patio. Executive chef Joshua Severson comes from the St. Regis Monarch Beach Resort & Spa to create a menu steeped with New American takes on classic steak, fish and chicken. For more information, visit www.selannesteaktavern.com. Selanne Steak Tavern, 1464 S. Coast Hwy., Laguna Beach, CA 92651, 949-715-9881. The Winery Restaurant & Wine Bar will be opening their second Orange County location in 2014. The new, two-story location will be situated in Newport Beach, on the stretch of Pacific Coast Highway known as Mariner’s Mile. Just like the original location in Tustin, the new spot will feature a menu that focuses on contemporary California regional cuisine, as built by executive chef Yvon Goetz. The Newport Beach location will also house a two-story temperature-controlled glass wine cellar capable of holding up to 6,000 bottles. The Winery Restaurant & Wine Bar, 3131 W. Coast Highway, Newport Beach, CA 92663, no phone. Scott’s Restaurant & Bar has expanded and revamped its brunch program. The Costa Mesa eatery, located across from South Coast Plaza, offers a two-course plated brunch on Saturdays and Sundays, which can be augmented with a Bloody Mary or free-flowing Champagne. Select items include Nutella brioche French toast, crab Benedict, and a bacon and egg flatbread. The cost is $20 for the brunch alone, or $30 with a Bloody Mary or Champagne. Scott's Restaurant & Bar, South Coast Plaza, 3300 Bristol St., Costa Mesa, CA 92626, 714-979-2400. Bruno’s Trattoria is now offering a weekly Sunday Supper --- a special family-style, multi-course dinner designed to replicate a classic end-of-the-weekend family dinner. Guests that come to the downtown Brea eatery can share an antipasto platter; a pasta trio of spaghetti and meatballs, gnocchi and penne puttanesca; and a homemade dessert platter. The cost is $23.50, or $9.95 for children under 11. For more information, please visit www.brunosbrea.com. Bruno's Trattoria, 210 W. Birch St., Brea, CA 92821, 714-257-1000. 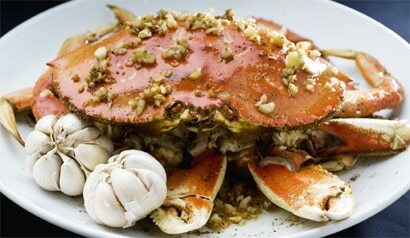 AnQi Gourmet Bistro by Crustacean presents House of An’s Secret Kitchen Crab Dinners, available on Tuesdays. This is a unique beer-pairing meal prepared in the spirit of the South Coast Plaza venue’s sister location in Beverly Hills. Guests will have the opportunity to indulge in a roasted crab meal prepared by master chef Helene An, complete with her renowned garlic noodles and a carefully picked selection of Asian beers. Diners will also have the opportunity to participate in a meet and greet with An and will receive a set of specially handcrafted chopsticks. The cost is $98 per person, excluding tax and gratuity. There is a minimum of two guests required. For more information, visit www.anqibistro.com. AnQi Gourmet Bistro by Crustacean, South Coast Plaza, 3333 Bristol St., Costa Mesa, CA 92626, 714-557-5679. Asada Laguna has closed its doors. The Laguna Beach restaurant, which had served up Mexican cuisine and featured a tequila bar, opened in the city’s downtown area in 2011. No replacement venue has been announced to fill the shuttered space. Asada Laguna, 480 S. Coast Hwy., Laguna Beach, CA 92651, no phone.